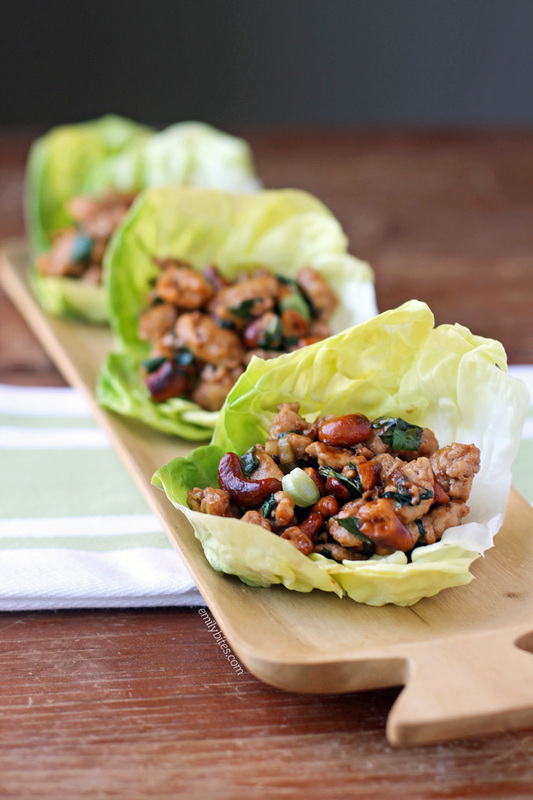 These Cashew and Basil Chicken Lettuce Wraps contain so many of my favorite ingredients that I knew I was going to adore them the moment I saw them. Chicken, cashews, hoisin sauce (swoon) and basil? It’s like this recipe was plucked out of my many, many food dreams. I was sent an advanced copy of the lovely and talented Andie Mitchell’s new cookbook, Eating in the Middle: A Mostly Wholesome Cookbook, and this recipe caught my eye right away. That’s not to say the rest of the recipes in the book didn’t make my mouth water. I know buying a cookbook can feel like a toss-up and sometimes you end up not finding as many go-to dishes as you’d hoped, but this book delivers. Even though this particular recipe jumped out at me, I still had a difficult time deciding which dish to share from the book. Morning Glory Muffins, Shredded Brussels Sprouts Salad with Bacon, Apple and Gorgonzola, Lightened-Up Pad Thai and Chicken with Sun-dried Tomatoes and Feta were all top contenders. I’ve been a big fan of Andie’s since before I even started my own blog, and you may know her from her site (formerly Can You Stay for Dinner?, but recently renamed AndieMitchell.com) or from her New York Times bestselling memoir, It Was Me All Along. I had the opportunity to meet Andie early in my blogging career and I can share with you that she is every bit as sweet, gorgeous, engaging and genuine as she comes across in her writing. After I babbled at her like a delirious fangirl, she even offered to buy me a drink later that evening. This girl is a class act. If you’re familiar with Andie and her relatable journey through weight loss and maintenance, you know that she truly loves food the way many of us love food. She talks about her “relationship” with eating and it’s something that truly resonates with me. Eating in the Middle represents the way that Andie now eats: a balanced approach with mostly healthy, wholesome, flavorful recipes, and a sampling of more decadent indulgences to enjoy more occasionally. This is a mostly-healthy cookbook that truly celebrates food, flavors and living a healthy lifestyle in a sustainable and joyful way. Eating in the Middle includes sections for breakfast, lunch, vegetables and sides, dinner, “for sharing” (a more indulgent chapter) and desserts (also indulgent). Every recipe in the book includes nutrition information, even the more decadent dishes, so it’s easy to plan for those who are tracking nutrition information or Weight Watchers points. As high as my expectations were for these Cashew and Basil Chicken Lettuce Wraps, the finished product still somehow managed to blow me away. I found the wraps super filling and a perfect blend of sweet and savory. 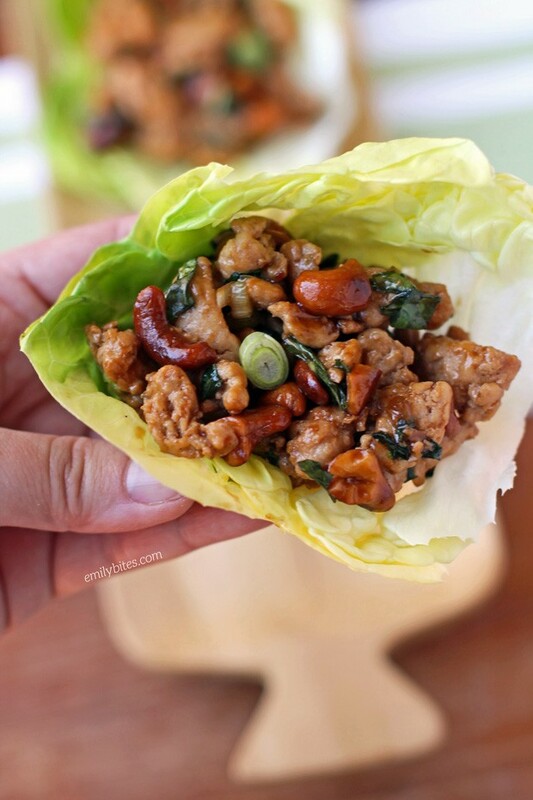 The crunch of the toasted cashews and the cool, crisp lettuce gave these great texture and I loved the freshness of the basil and scallions. I already can’t wait to make these again! 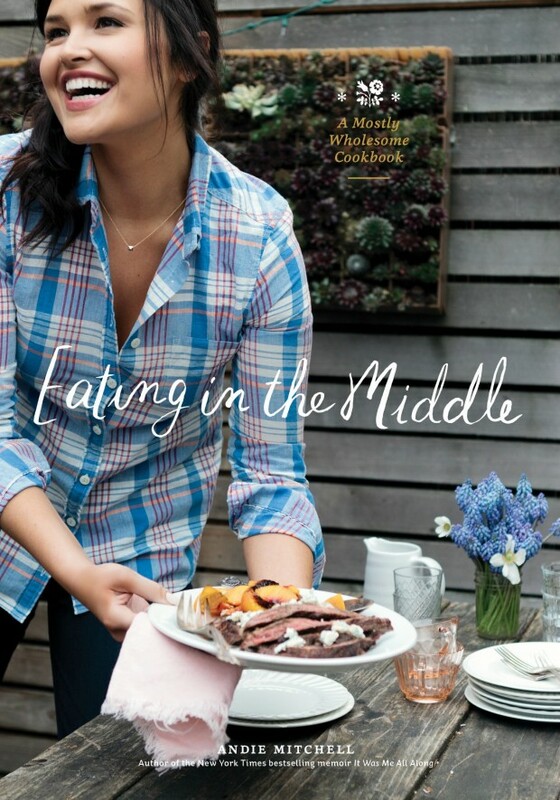 Eating in the Middle is on sale starting today and you can order a copy here on Amazon (affiliate link) or go to your local Barnes & Noble or Target to pick up a copy of your own! Disclaimers: Andie reached out to me and asked to send me an advanced copy of her book. I was under no obligation to write a review or share a recipe, but I chose to share this with you all because I truly love the book and think you all will too! This post contains Amazon affiliate links. Preheat your oven to 350 and spread your cashews across a baking sheet in a single layer. Place in the oven for 10 minutes or until golden and toasty. Set aside to cool and then chop into pieces once cool to the touch. Combine the chicken broth, hoisin sauce, soy sauce, sugar and cornstarch in a small mixing bowl and whisk together until well combined. Set aside. Pour the canola oil into a large (12-inch) skillet and bring to medium-high heat. Once the oil is hot, add the garlic and stir. Cook garlic for around 30 seconds until fragrant. Add the ground chicken to the garlic and cook, breaking the chicken up into bite sized pieces using a spatula or wooden spoon, for 4-6 minutes until cooked through and browned. Add the scallions and the sauce mixture from step 2 and cook, stirring continuously, for another 2 minutes or until sauce thickens. Stir in the basil and cashews until well combine and remove from heat. Spoon the filling into the lettuce leaves and serve! Each serving is about ¾ cup of filling, so 3 leaves with ¼ cup each is an easy way to create a serving. Just ordered the book. So inspired- loved your memoir and look forward to learning how to make some spectacular new dishes. I am always trying to follow my own lifestyle changes that have allowed me to lose weight; this cookbook is a gift to myself to support that ongoing success! Definitely, it’s a great book! I made this tonight. It will definitely be a repeat! My picky kid went back for seconds! That’s super high praise. I am typing this as I eat this delicious meal! It’s soooo good! 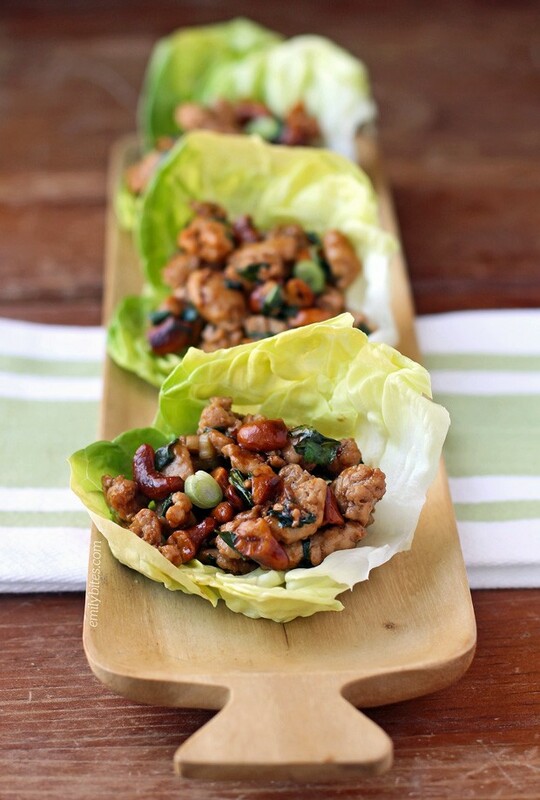 Next time I am craving Chinese food, I will be making this! Thank you Emily and Andie! Wow, now this is not something I see everyday on Pinterest! I love recipes I can’t wrap my brain around, and this looks like one of them. I will just have to try it for myself and see if it’s good! I may just put this on the menu at The Failed Dieter household next week! I’m so glad you loved it as much as I did! Made this tonight, whole family loved it, even my toddler! I’m getting 8sp when I put this into the WW recipe builder — that’s using the leanest ground chicken available and all other ingredients exactly as listed. Still delicious, thanks! I am typing this as I eat this delicious meal! It’s soooo good! This recipe was EXCEPTIONAL!!! Thank you Emily and Andie! These were amazing and simple!! This was SO incredible!!! I’ve made it twice in 2 weeks. The second time I made a double batch & left out the oil & cashews to reduce the points value for a lunch option. Still yummy! I will be meal prepping this regularly I’m certain of it! !